Dr. Sanjay Rajdev is an expert in radial angiography and angioplasty. He trained in USA for 3 years and specializes in complex angioplasty procedures along with treatment of heart attacks (STEMI) and in the endovascular peripheral arterial disease. SevenHills Hospital has a fully integrated cardiovascular unit providing all aspects of cardiovascular care under one roof. 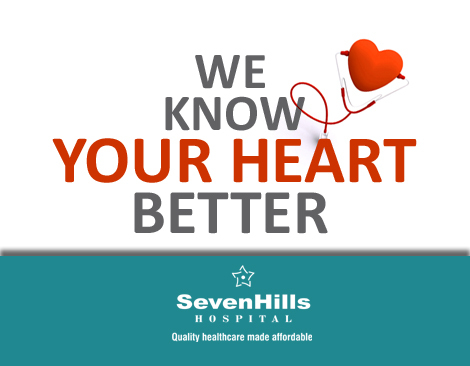 Cardiology section represents one of the largest, most modern and state-of-the-art cardiac care facility which is accessible and affordable. Cardiac Care Unit (ICCU) is outfitted with modern and sophisticated equipments. This combined with caring staff and trained doctors make patients stay comfortable. Cardiac Catheterization Laboratory is equipped with high tech digital flat panel Siemens ARTIS AZEE system for angiography and angioplasty. Transplantation in patients with heart failure.